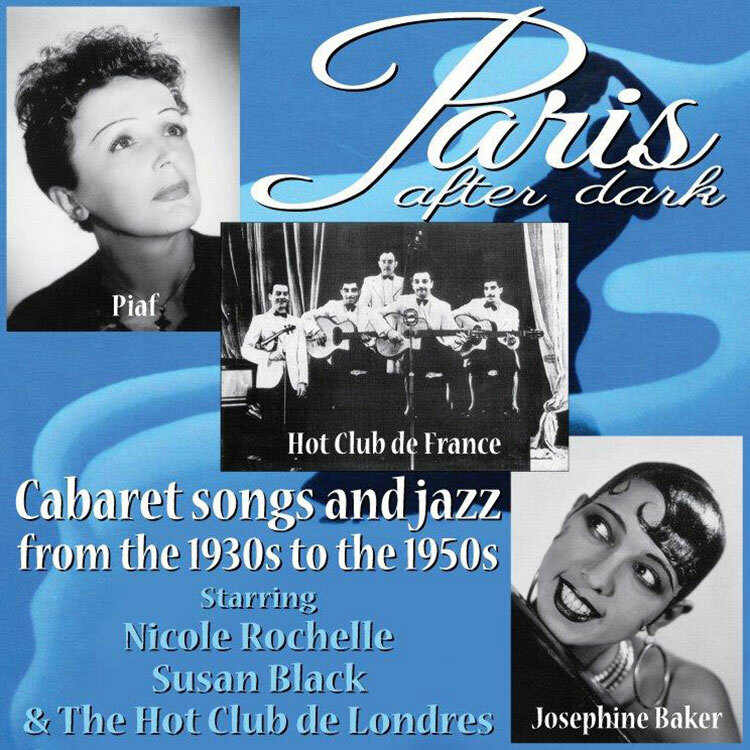 Billed as a billet-doux à nos amis for the day after the UK was to leave the EU, the Jazz Repertory Company’s Paris After Dark was an evening split three ways between Edith Piaf, The Hot Club and Josephine Baker or, to put it another way, between Milord, Nuages and J’ai Deux Amours and more of the same. Apparently – and to my chagrin, because why wasn’t I told – The Jazz Repertory Company aka Richard Pite have been mounting jazz-based shows for several seasons and Paris After Dark is the first of five in 2019 at the same venue between now and November. If the presentation by Pite, eight other musicians and two songbirds – four numbers à la Piaf, four numbers à la Hot Club, four numbers à la Baker in the first set (replicated in exactly the same order in set two, with mood-destroying changes between performers) – verged on the unimaginative this was, to some extent, negated by the quality of the performers. Having said that, this was a concept, from the title onwards, that cries out for a small boite where intime is the name of the game, and not a 950-seat arena better suited to The Ring Cycle On Ice. Nor does the venue do any favours to the performers. In most of the venues where I find myself on behalf of Jazz Journal the management displays a touching concern for the electric light bill so that without a discreet torch I am unable to see my notebook in front of my pen. At Cadogan Hall however they throw everything they have at the stand so that you could, if you had a mind to, read the collar size on the bass player’s shirt. However they don’t call me lion-hearted for nothing and at given moments I was able to close my eyes for 28 bars and be transported to the ABC and/or Bobino back in the day when filet mignon was two francs, ninety at Maxim’s. But where are my manners? I haven’t introduced the performers: in the red corner, Susan Black, Edith Piaf soundalike with a strong voice and a fearless manner. She offered electrified readings of Milord, L’Accordioniste, and La Vie En Rose. In the blue corner, masquerading brilliantly as Josephine Baker, Nicolle Rochelle, who scored heavily with J’ai Deux Amours, Tonkinoise and two numbers, Qui and Bonsoir, better known to us in English as Jerome Kern’s Who, and the number Alice Faye sang to Shirley Temple in the movie Stowaway, Goodnight, My Love. Playing the part of Stephane Grappelli was Mike Piggott, opposite Nils Solberg as Django Reinhardt. Overall it was a satisfying and recommended evening.